To successfully plan and carry out your next corporate event, formal party or wedding, you need a team of people with the same attention to detail and commitment to quality customer service as you. Whether you are organizing a small family wedding or in charge of a corporate affair with hundreds of attendees, we will provide the luxury portable restrooms that best suit your occasion. We understand that stylish and classy are not the first words that come to most people’s minds when thinking of portable restrooms. We also understand that you may not spend a lot of time calculating the sanitation needs of large groups of people. 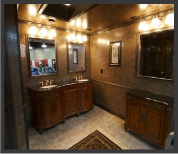 Our portable restroom trailers are spacious, well-lit, and meticulously well-maintained. We have several options available and will consult with you to determine the correct number for your golf tournament or other outdoor events. Executive Luxury Portable Restrooms – Only the Best! 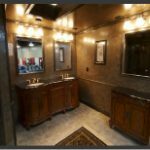 Our VIP Executive Restroom Trailers have the look and custom fixtures you would expect to see in the bathrooms of high-end homes. They also feature music from the big band era playing on a quality sound system. You really need to see these portable restroom trailers yourself to fully appreciate them. Tastefully decorated and roomy, these luxury portable restrooms ensure that every guest feels appreciated and comfortable. Contact us today for a quote. You will be amazed at the luxury available at an affordable price. We know you will be impressed by our personalized attention and dedication to ongoing customer service. We take our reputation seriously and work hard to help you build and maintain your reputation, too. Luxury portable restrooms demonstrate your commitment to providing guests at your special event with a top quality experience in every way. 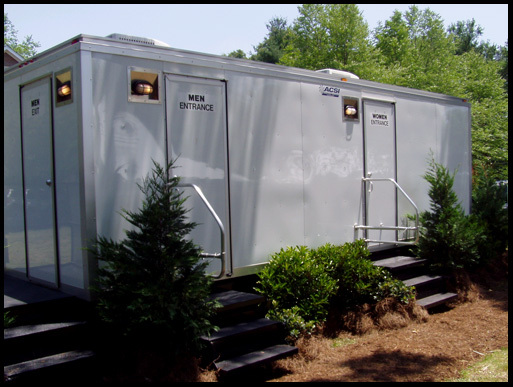 We’re sanitation experts with more than 30 years of experience providing portable restroom solutions to communities, municipalities, corporations, and event planners all across Greenville, Spartanburg, Columbia and the Upstate. 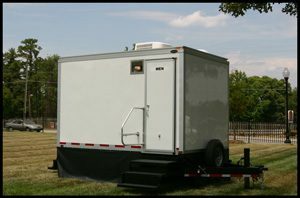 Contact Bragg Waste Services when you need the best options for VIP restroom trailers and luxury portable restrooms for your event.